What it’s about: One of the strangest moments in both the papacy and the legal profession. In 897, Pope Stephen VI (confusingly sometimes called Stephen VII) claimed the pontiff two leaders prior, Pope Formosus, was illegitimate, and put Formosus on trial for usurping the Holy See. This was only mildly complicated by the fact that Formosus had died a year earlier. Biggest controversy: Formosus also had plenty of trouble with the papacy while he was alive. In 864, Formosus was elevated to Bishop of Porto-Santa Rufina, in Rome, and then sent to Bulgaria as a missionary. He was so popular among the Bulgarians that they requested him as their bishop. The request was denied by then-Pope Nicholas I, as bishops were not allowed to move from one post to another. But Formosus’ popularity was noted (and seems to have been his only crime). When Nicholas died in 867, John VIII became pope, and must have had it in for Formosus from the start, because the bishop fled Rome. The new pope publicly claimed Formosus corrupted the Bulgarians, convincing them not to accept any other bishop in his place, and that this was a stepping stone to Formosus usurping the papacy itself. John excommunicated Formosus and several associates. Strangest fact: Formosus’ relationship with the church was a roller coaster. When John VIII died in 882, Formosus’ name was cleared and he returned to Porto as bishop. Nine years later, Formosus himself was elevated to the papacy, where he remained until his death at around age 70. His successor, Pope Boniface VI, seemed to have no quarrel with Formosus, but he died after only two weeks in office. He was followed by Pope Stephen VI, who had a bone to pick with Formosus’ skeleton. With a deacon speaking for the deceased pontiff, Stephen grilled him on his supposed plan to usurp the papacy, and found him guilty. He stripped the corpse of its papal vestments, cut off the three fingers he had used for blessings while alive, and invalidated all of his acts as pope (including ordaining Stephen himself as a bishop). His body was buried, then dug up again and thrown into the Tiber River. Thing we were happiest to learn: Even in losing the trial, Formosus won. The public viewed digging up a former pope’s corpse to be distasteful at the very least, and public opinion turned against Stephen, who was deposed, imprisoned, and strangled while in jail. Meanwhile, Formosus’ body had washed up on the banks of the Tiber and was rumored to be performing miracles. 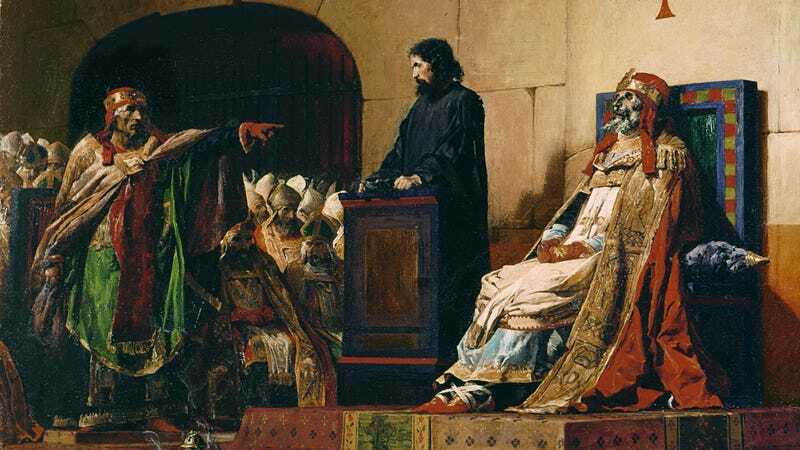 Stephen’s successor, Pope Romanus, served for only 92 days before being forced from office, but his successor, Pope Theodore II, annulled the Cadaver Synod, excommunicated seven cardinals who had participated, and had Formosus buried once again, this time in St. Peter’s Basilica. Thing we were unhappiest to learn: Formosus’ posthumous fortunes turned again. Rehabilitating his image must have taken most of Theodore’s papacy; he served only 19 days in December 897 before dying. The next six years saw three popes and one short-lived antipope, before Sergius III’s relatively long seven-year reign. Sergius had been one of the judges at the Cadaver Synod, and he overturned Theodore II’s rulings, reversing the verdict back to guilty. Formosus’ Wiki page says scholars are divided on whether Sergius had Formosus dug up again and beheaded or left his long-suffering body alone. Also noteworthy: The Cadaver Synod was most likely motivated by worldly affairs, not spiritual ones. Just before Formosus’ time as pope, Stephen V crowned Guy III as Holy Roman Emperor, but, “nervous about Guy’s aggression,” Formosus offered the crown to Arnulf Of Carinthia if he would just invade Italy and take it. Arnulf’s invasion failed, but Guy died shortly after. Formosus again asked Arnulf to overthrow Guy’s son, Lambert II, and on the second attempt, he succeeded. Formosus crowned Arnulf Holy Roman Emperor in 896. However, Arnulf suffered a stroke the same year and, (in a recurring theme in this story), died shortly after taking power. Lambert re-took the throne, and anti-Formosus sentiment ran high, although he had died a few months before Arnulf. Hence, posthumous trial. Further down the Wormhole: Another tactic Romans used to punish the dead was damnatio memoriae, the practice of removing someone from the historical record. Wikipedia gives the recent example of removing Roseanne from Roseanne (although digitally erasing her from reruns would be a more apt comparison), and the ancient example of Hatshepsut, the 15th-century Egyptian pharaoh whose male successors tried to erase her. We’ll peer into the gaps in the historical record next week.